This post is a continuation of the previous post on the matter: A Case Of a Dumb Decision. Instead of making the original post longer and longer by adding more and more examples of “management” I decided to start a new one. The pictures above are taken in some garage. 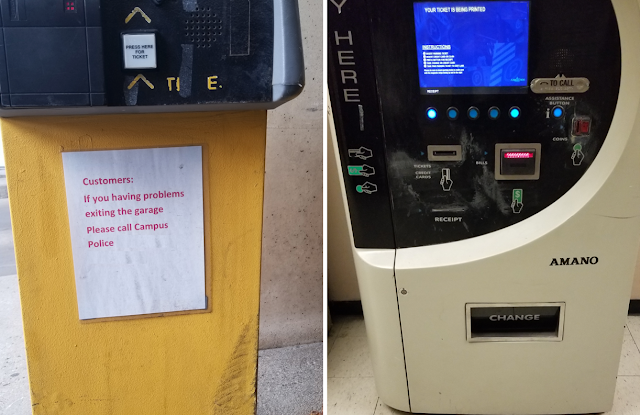 Every visitor of the garage has to take a ticket (picture on the left), and before leaving the garage has to validate the ticket in a machine (picture on the right). Some people do not know about validating and proceeded directly to the bar gate without validating a ticket. If that happens, the bar gate does not move, and a driver has to call the campus police. Then a security guard has to go to the car, talk to the driver, explain that the ticket needs to be validated, so, the driver needs to backup, find a spot to park a car, go to the machine, validate the ticket hoping the total time will not change (or a driver would have to pay extra), go back to a car and drive to the bar gate again. Evidently, that has been happening enough time to force management place a sign – as shown in the next picture. Well, the fact of the matter is that this sign is placed at the bar gate that needs to be opened to leave the garage! So, a driver who did not validate a ticket but drove to the gate, realized that the ticket did no open the gate, had read the sign, backup the car, etc., etc. This sign solved a problem – one specific problem. Now a guard does not have to walk to a car to explain what to do. The problem this sign has solved was the annoyance of the campus police. However, naturally, this sign does not help anyone who is entering the garage and not familiar with the whole procedure. Could THAT problem be addressed – the problem of helping people to avoid all the troubles in the FIRST place? I’ll keep you in suspense. Of course, the actual solution would be placing a warning sign at the entrance! And such examples exist, for example - Logan Airport garage. The difference between where to place a sign demonstrates the difference between management and “management”. Every organization (a.k.a. a system) has its mission, goals, functions. A manager is like a conductor, responsible for finding right people and orchestrating the most efficient work on their part. If something goes "south", ultimately, that's a manager's fault. 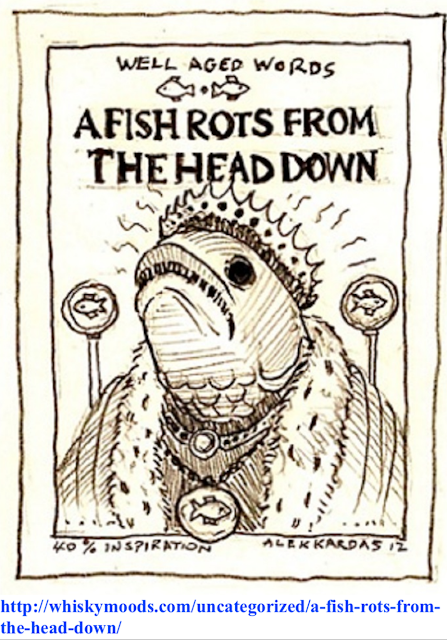 "Fish rots from the head down" - people say it for a reason (and Russians add "... but gets eaten from its tail"). A manager thinks about making life of clients/users better/easier. A “manager” thinks about … well, this sentence may have many different endings. It’s easier to say what a “manager” does not think about – he or she does not think about the mission of his/her organization, does not think about improving the efficiency of the functioning of the organization. Or maybe this "manager" does care about his/her organization, maybe he/she is a nice person, but just incompetent. It does not matter. The results mater, not the reasons. That is why he/she cannot really be called a “manager”, but rather a clerk, someone who is busy to do all paperwork to make it look good, but does not really think about anything beyond that. The signs of “management” of such “managers” are everywhere – in business, in public institutions, in governing, in politics. And from my personal perspective, over the last 10 - 15 years we can see more and more “managers” like that. My interpretation of this phenomenon is that we are observing a natural state in a history of any country when the ruling elite has entered a process of degradation. But that is a very different story. BTW: in the opening picture "self confidence" is not a skill. 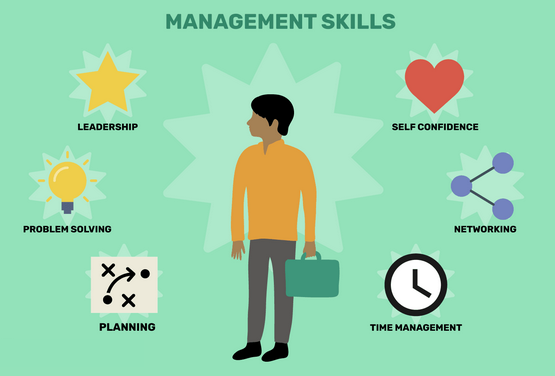 There are many "management trainers" who don't really know what management is, they are often no different from a motivational speaker - "you have to believe in yourself, be on time, talk to people!" A good manager needs people skills, but having people skills does not make one a good manager. There are many logical conundrums like this one. Another one - "A good politician needs to have charisma, but having charisma does not make one a good politician". In late 1980-early 1990s Russian economist, politician and administrator Gavriil Popov has developed "Administrative Theory". In part, he stated that a bureaucracy - any bureaucracy (governmental, political, administrative, scientific, financial, ...) - if not checked regularly via open-channel feedback always inevitably becomes a self-serving machine. The main goal of bureaucracy, i.e. of each and every bureaucrat, becomes (a) a the minimum - self preservation; (b) at the maximum - self-promotion. Bureaucracy assess every action, every step, every plan from those two points of view: does it represent a threat to personal surviving? does it help to get some personal gains? Personal goals of a bureaucrat override goals of the organization/system. Statements like "I am the state!" or "Let be a flood after us" capture the essence of such bureaucratic psychology. A book "Backstabbing for Beginners" offers a great description of how a bureaucratic machine works (in this case the UN), how it eventually leads to corruption (and "losing" billions of dollars). A manager is a bureaucrat. He or she also is at risk to place his/her own personal goals above the goals of the system he/she manages. That is why every effective managing always includes checks and balances, and must be as open as possible. A closed system eventually comes to a stagnation, degradation, and a decay. It it gets absorbed by another system. Or it gets blown up from an inside. 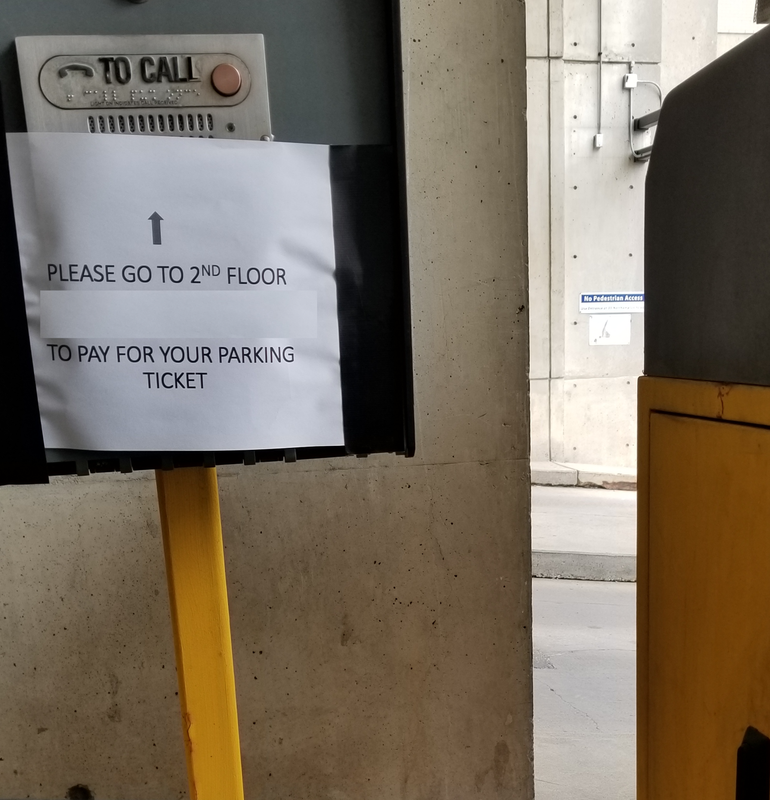 When a car with no permit enters this garage, the attendant spend at least five minutes to talk to the driver, find out what's what, make the driver leave or issue a temporary permit. During peak ours a line of several cars may grow behind. 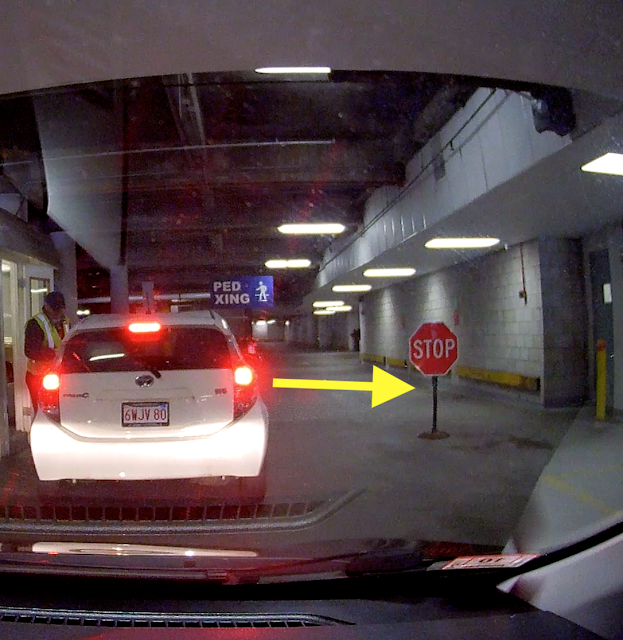 What needs to be done is very simple, an attendant need to tell the driver to move the car in a spot on the right. And then do his thing. But it is not the attendant's responsibility to come up with this step. The garage manager has to do that. And if he/she doesn't that means that he/she is not a manager, but just a "manager".